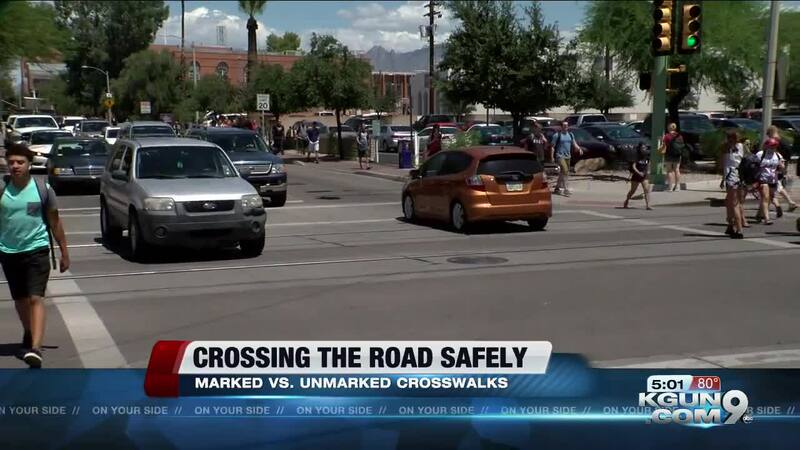 The city of Tucson is planning to add more unmarked crosswalks versus marked crosswalks when repaving roadways for pedestrian safety. TUCSON, Ariz. — The City of Tucson is planning to have fewer noticeable crosswalks when repaving roadways for pedestrian safety. Crossing the roadways may seem like an easy task. Most people look for a marked crosswalk, look both ways and then cross the street. However, according to a Diahn Swartz, Traffic Engineering Manager with the City of Tucson, this isn't always the safest option. "Research indicates that under certain conditions, marking a crosswalk alone without any other treatment increases the risk that the pedestrian may be injured crossing the street," Swartz said. When crossing the roads, as a pedestrian, a marked crosswalk is white lines, or a sign, that outlines a designated path to cross. However, an unmarked crosswalk doesn't have any line, which is proven to be safer. Swartz said, having a marked versus an unmarked crosswalk depends on traffic volume, number of lanes and speed limit in a certain location. "The motorist have a legal obligation to yield to pedestrians in unmarked crosswalks just as they have the legal obligation to yield to pedestrians in marked crosswalks, Swartz said. "Pedestrians should be careful regardless because they may not yield in either case." According to a study done by the U.S. Department of Transportation, evidence shows there is a increase in crashes on marked crosswalks over unmarked crosswalks as a reflection to "pedestrian's attitude and lack of caution when using the marked crosswalk." The study said many pedestrians consider marked crosswalks as a tool to enhance pedestrian safety and mobility, viewing the marking as their right to share the road and cross as they please. In many cases, the study said pedestrians assume motorist can see the crosswalk just as clearly as they can, but that isn't always correct. A Governor's Highway Safety Association report shows pedestrian deaths have increased by 35 percent in the last decade. This same report ranks Arizona as the second deadliest state for pedestrians. According the Director Alberto Guiter with the Arizona Governor's Office of Highway Safety, that number is only increasing. Two problems he said are contributing to this number are more people speeding and distracted driving. To stay safe, always remember to look both ways before crossing the street.